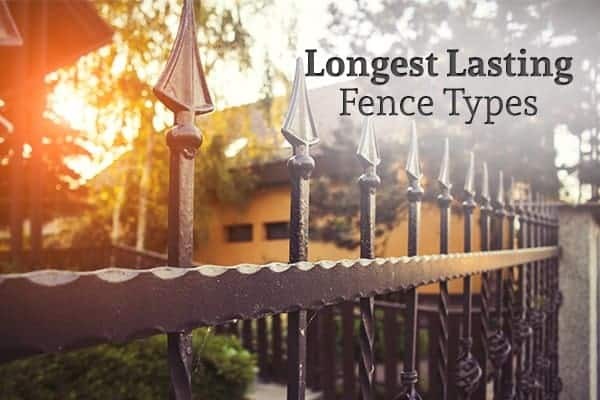 Home » Rustic Fence Blog » What Type of Fencing Lasts the Longest? Regardless of these factors, however, one thing’s for sure: you want a fencing material that will stand up to the test of time. This way, you’re not wasting your money on premature repairs or replacement down the road. If you’re wondering what type of fencing tends to last the longest, we’ve got some options worth considering—as well as some other tips and information to keep in mind for your upcoming fencing project. Generally, the two most durable and long-lasting fencing materials include wrought iron and steel fencing. Steel is a little more common on residential properties due to the fact that it is lighter and more versatile than wrought iron. Still, steel fencing can be extremely heavy and durable as a result. Many homeowners also like the option of steel fencing because it can be racked to accommodate sloped or uneven land, which cannot be easily said of all fencing materials. What makes steel fencing so durable? Aside from its sheer weight, most steel fencing material these days is galvanized and powder coated during the manufacturing process. As a result, it is resistant to rust and will therefore stand up to the test of time – so long as it is properly maintained. Wrought iron is also an extremely durable and long-lasting fencing option. While it’s a little less common on residential properties, it’s an extremely strong option; it will never warp and rot like some other fencing materials can. It can be susceptible to rust spots over time, but this is easily fixed with a little bit of regular sanding and repainting. Another feature of wrought iron fencing that many homeowners enjoy is the fact that it tends to look even better with age, as wrought iron develops a beautiful patina over time as it oxidizes. While steel and wrought iron are by far the longest-lasting fencing materials available in today’s market, it’s important to understand that these are not always the most practical options for a person’s unique fencing needs. Because steel and wrought iron fencing isn’t made with panels, it doesn’t tend to offer very much in the way of privacy. Therefore, if you’re primarily looking to install a fence to add privacy to your property, you’ll probably want to explore another fencing material that comes in panels (such as wood or vinyl). Furthermore, due to its heaviness and long-lasting durability, it’s also important to be aware that steel and wrought-iron fencing tend to be among the more expensive fencing options available. On the flip side, because these fencing types can last for decades without the need for substantial repair or replacement, the added up-front costs can be more than worth the savings and peace of mind in the long run. There are some other options worth considering that can also be quite durable and long-lasting. Vinyl is a more budget-friendly option that requires relatively low maintenance—and when installed properly, it can easily last for years without the need for repair or replacement. Vinyl fencing is also one of the most versatile options on the market, as it comes in a wide range of styles, heights, and colors. It can be a practical option for those looking for privacy fencing or pet containment, or for just about any other purpose. Chain link fencing is another relatively durable and long-lasting fence material that’s extremely inexpensive to install and requires very little maintenance. Due to its design, it is more suitable for pet containment and other utilitarian applications than for privacy or curb appeal. Still, it’s a very popular option among homeowners due to its affordability and low maintenance. Most chain link fencing comes galvanized to help protect it against rust; however, you may need to refinish or repaint your fencing from time to time to keep it fully protected. These are just a few fencing material options to keep in mind if you’re looking to install a durable, long-lasting fence on your property with minimal maintenance required. For more information on residential fencing options or to schedule a free quote for your home’s upcoming fencing project, be sure to contact our team at Rustic Fence today.